InfoPath and SharePoint Designer Replacements: What Are My Options? Our managed services team frequently gets asked about options to replace InfoPath and SharePoint Designer. InfoPath forms libraries still work in SharePoint Online and SharePoint 2016, but many of our customers are looking to decrease their use of InfoPath in SharePoint due to the long-term roadmap. SharePoint Designer 2010 and SharePoint Designer 2013 workflows also still work, but Microsoft announced there would be no SharePoint Designer 2016 at Ignite in 2015. At Ignite 2016, Chris McNulty from Microsoft re-affirmed support for InfoPath and SharePoint Designer until 2026 while other technologies mature. Out-of-the-box SharePoint has a list form that can be edited in the browser. While limited, this may meet the need for basic forms to enter data in a list. In the past, it was common to use SharePoint designer to build a custom list form or use InfoPath. Another more modern option is the use JSLink to build a custom form or customize list views. Nintex is a great 3rd party forms and workflow designer for both Office 365 and SharePoint Server. Recently, they simplified their pricing to provide one model for both SharePoint Server and Office 365 based on number of workflows. InfoPath developers have complained that Nintex does not offer an exact one-for-one replacement of all features in InfoPath. Our team has had to train InfoPath developers that the design philosophy for Nintex Forms and Workflows should be different from some of the ways InfoPath and Designer have been used in the past. On August 1st 2016 Chris Ertz from Xgility presented on Flow and Power Apps at the Reston SharePoint user group. These are two features are currently in preview with Office 2016. 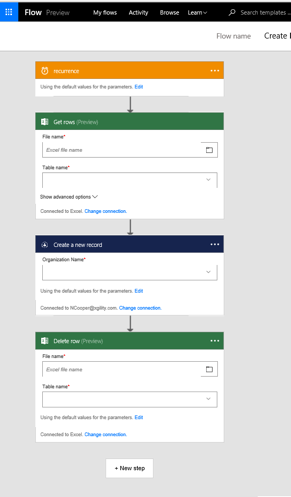 In the demo, he used flow to pull data from CRM into a SharePoint list to create a proposal. Chris also demonstrated how PowerApps can connect to data sources such as SQL, Excel, or a SharePoint list. While both PowerApps and Flow are promising, they are new. 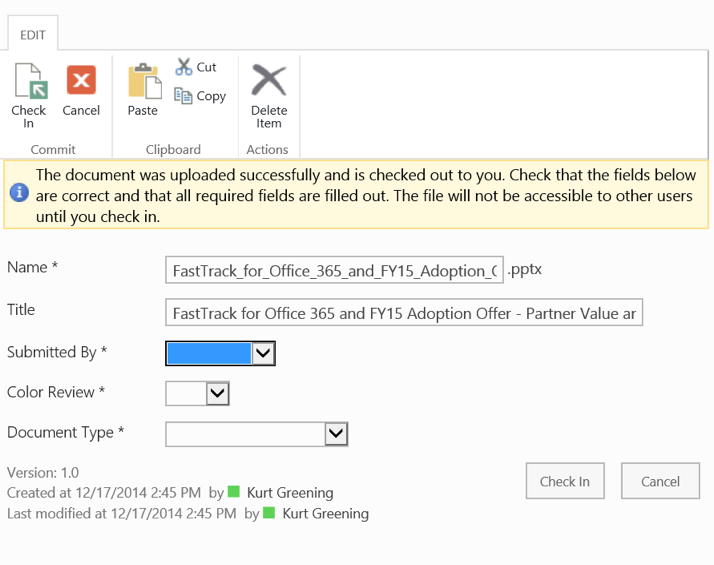 Office 365 users may notice that the new document library look has flow in the ribbon. 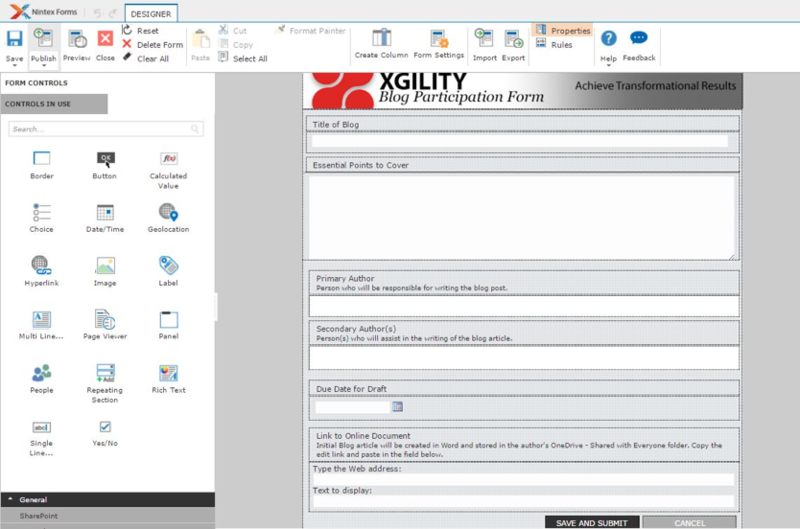 .NET Developers as part of Xgility staff can use Visual Studio to build custom forms. 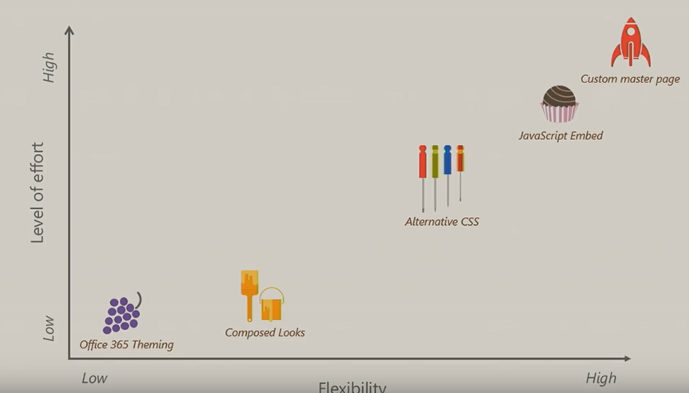 The disadvantage is that creating and editing the form will require a developer. For some requirements a custom form is the best option. Structured Documents can be part of a special template in SharePoint known as a content type. The document information panel is no longer a feature in Word 2016, but a structured document can be used to fill in metadata and can be used as a simple form. This might be used with documents such as proposal templates or status reports. In the past, SharePoint developers would create custom master pages using SharePoint designer. In SharePoint online, our team is more likely to use Themes due to concern that some customizations can break due to Office 365 updates. We have also successfully used templates like those available from bindtuning. Do you have a business application in mind and are wondering the best way to build it in SharePoint? Our managed services team provides training and direction through regular governance. If you want to know more about your options, please contact us. https://www.xgility.com/wp-content/uploads/2016/08/Picture3.png 497 291 Kurt Greening https://www.xgility.com/wp-content/uploads/2015/09/xgility-logo3-sharepoint-azure-office365-copy.png Kurt Greening2016-09-21 11:00:422018-12-10 15:12:24InfoPath and SharePoint Designer Replacements: What Are My Options?